Build in Thailand the M/V Deep Andaman Queen (formerly Queen Scuba) is 28-meter long and just over 7-meters wide, twin-engine steel hull motor boat, with the highest safety standards on board. M/V Deep Andaman Queen was built in 2003; she operates in the Andaman Sea from October to May providing the best diving in Thailand with a comfortable capacity for 21 guests. She underwent a major refit and Overhaoul in 2012 to improve her to near new conditions. 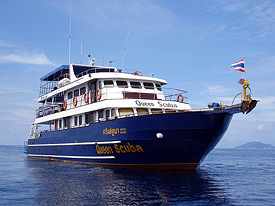 M/V Deep Andaman Queen offers our guests one of the largest dive platforms in the South East Asia area. The Dive Deck consists of a very wide and spacious kitting-up area on two levels, a separate entry/exit platform, 2 exit ladders with 2 fresh water showers to rinse yourself or your equipment after your dives. You will also find 2 large buckets with fresh water for rinsing cameras, dive computers, and dive lights. M/V Deep Andaman Queen has a "fill in place" air station with 2 compressors. After each dive, your cylinder will be refilled at your station without removing your gear so there is no unnecessary moving around. You just put all your equipment together on the first day, and for the rest of the trip relax and Dive, Dive, Dive! She is now equipped with a Nitrox membrane system and can fill all cylinders with Nitrox 32% for all dives. All Professional PADI Dive Staff on board are certified as gas blenders to ensure your safety! If you are not certified as a Nitrox Diver, we are happy to offer you the Enriched Air (Nitrox) Diver course, Advanced Open Water course and any other specialty courses on board or before the liveabord cruise.